Dancing for Daisy | East Coast Orthotic & Prosthetic Corp.
Olivia Pino has worked for East Coast Orthotic & Prosthetic Corp. for almost a year, after graduating from Rutgers University where she was an active fundraiser for many noble causes. However, the cause closest to Olivia’s heart is the Rutgers University Dance Marathon which benefits the Embrace Kids Foundation. Rutgers University Dance Marathon is a fundraiser for Embrace Kids Foundation, a charity that helps provide for the non-medical needs of children diagnosed with cancer and blood disorders. Embrace Kids offers a wide variety of services including emergency financial support, trauma counselors, tutors, and child-life specialists. Rutgers University Dance Marathon is the largest student-run philanthropy in New Jersey, and participants have been helping Embrace Kids for more than a decade. This year’s event will take place April 6 – 7th at Rutgers University where the volunteers will pledge to stand on their feet for 32 hours straight. Last year was Olivia’s third and final year participating in Rutgers University Dance Marathon and the event raised a record-breaking $442,075.06 for the children. Despite graduating, Olivia continues to remain in fundraising and charitable efforts for the Embrace Kids Foundation. Last year, Olivia led her sorority Phi Sigma Sigma, which raised over $40,000, the largest amount ever raised by any organization involved. 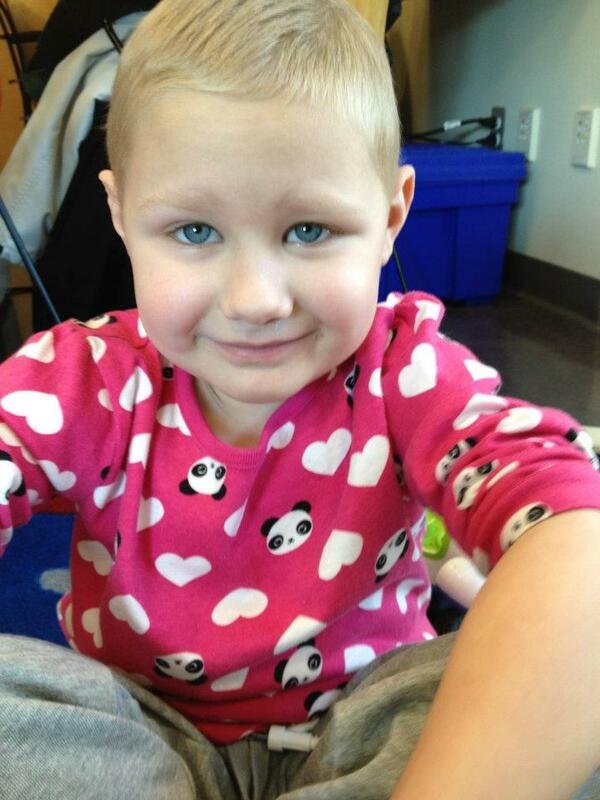 Olivia was personally responsible for fundraising $3,000 of that total team amount. Her $3,000 was the most individually fundraised during the event. A photo of Daisy in her favorite pink hearts and pandas shirt. Olivia and Daisy together for a meet and greet. 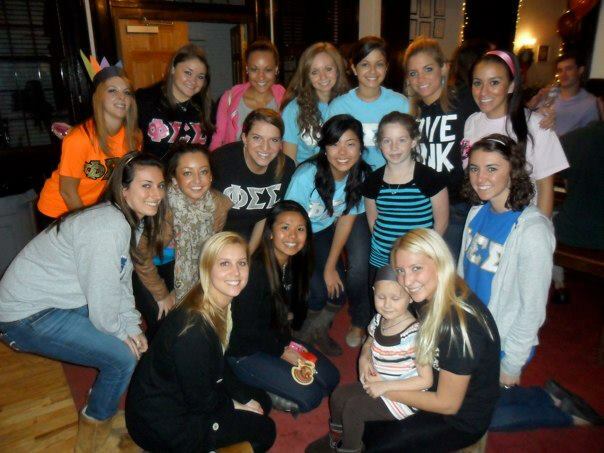 Olivia and her sorority worked with two young girls, Daisy, 5 and Dhara, 7, who were diagnosed with Leukemia. 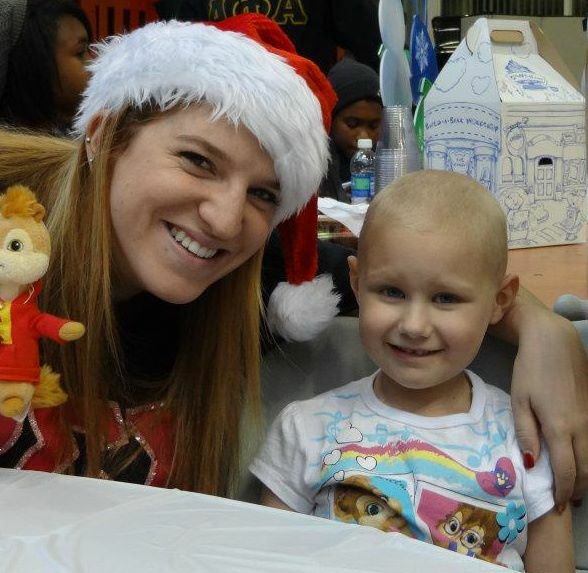 For Olivia, working with the children is something she is particularly passionate about. “Unfortunately, even the most good-hearted individuals are forced to endure difficult circumstances. This has been the case for Daisy, Dhara, and their families,” said Olivia. “However, when we look at Daisy and Dhara we don’t see just sick little girls. On the contrary, we see incredible girls filled with happiness, strength, and a lust for life. Both Daisy and Dhara are surrounded by many people who love and care for them, and that love is infectious. As much as the sisters of Phi Sigma Sigma have given to Daisy and Dhara, they have given us and taught us so much more.” Olivia went on to thank and praise Embrace Kids Foundation for helping the children live a normal life as possible.